Great for adults and older children to start painting!! 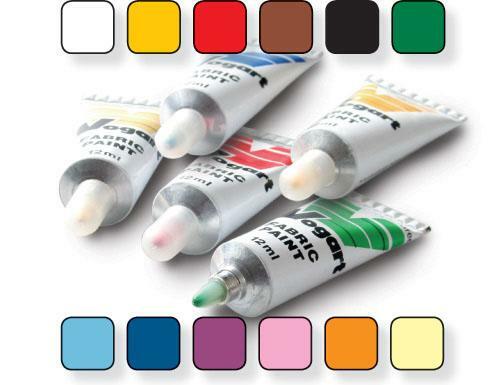 Fast drying, 12ml permanent ball-point paints in half size tubes in our 12 most popular colours. Includes: White, Yellow, Scarlet-Red, Brown, Black, Green, Light Blue, Blue, Purple Violet, Blossom Pink, Sunny Orange and Cream. Comes as a complete Set-of-12 Hobbytex Vogart Paints and colours are also available separately. Same great paint as the regular-sized tubes. (that can be easily painted in the 12 colours). I gave my daughter My mom's old paints. Are these paints used for canvas.